If you're only getting around South Bali—say, from the airport to your hotel in Nusa Dua, or from Legian to Seminyak—you only have to stand by the side of the road, lift your arm, and watch a taxi stop to pick you up. Taxis in Bali are abundant, with one at almost every corner in South Bali and Ubud. Special rules apply to the airport, where Ngurah Rai Airport Taxi holds a taxi monopoly at the arrivals gate. 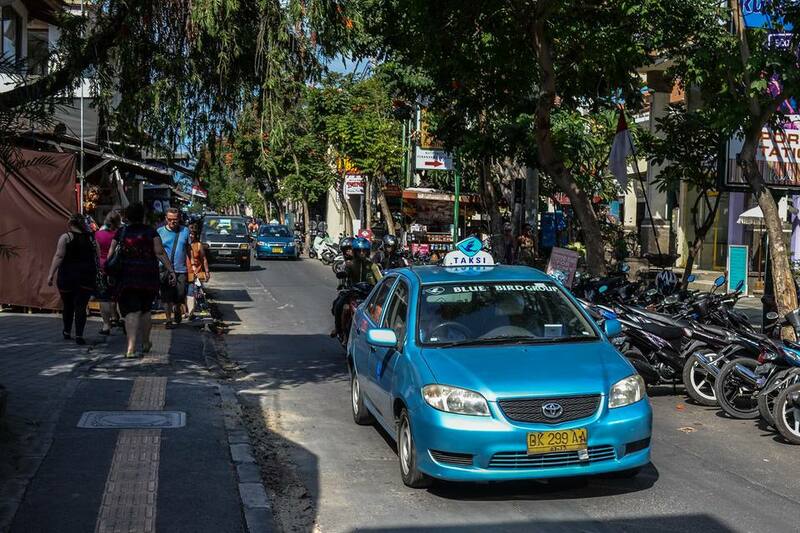 In Bali (just as in Jakarta) taxis are divided into two types—Blue Bird taxis, and everyone else. Blue Bird taxis have earned a reputation for being honest dealers in the often-corrupt taxi industry. Non-Blue Bird taxis, on the other hand, are known for dirty tricks—not using their meter and taking roundabout routes, among other things. Blue Bird taxis are light blue, with a bird logo enclosed in a rounded diamond, and "Bali Taxi" emblazoned on the side. At the airport, taxis are pre-paid at the taxi counter in front, with rates ranging from IDR 70,000 (US$5.60) for Kuta, to IDR 750,000 (US$60) for fares to Tulamben. The updated list of airport taxi fares can be read in the link below. If you want to ride other taxis from the airport, you may need to step out of the airport premises entirely to hail a cab. Another spoiler to traditional Bali taxi drivers' corrupt ways comes in the form of free smartphone apps that allow you to summon a taxi or hired car to almost any point on the island. Two competing car hire companies—the globe-spanning Uber and the Southeast Asia upstart Grab—both have a major presence in Bali. If the taxi driver offers to wait for you at your destination, consider it. Some places do not get a lot of taxi service (such as Pura Luhur Uluwatu), so it might be handy to have a ride ready for you when you're set to leave. Agree beforehand if you want him to keep the meter running while he waits, or if he's willing to settle for an hourly fee. IDR 50,000 (about US$4) is a good upper limit. You can also consult this handy article for more tips: Ways to Avoid Being Ripped Off in a Foreign Taxi. Taxis may be summoned over the phone. These taxis will be dispatched to your hotel or location if you call for them.